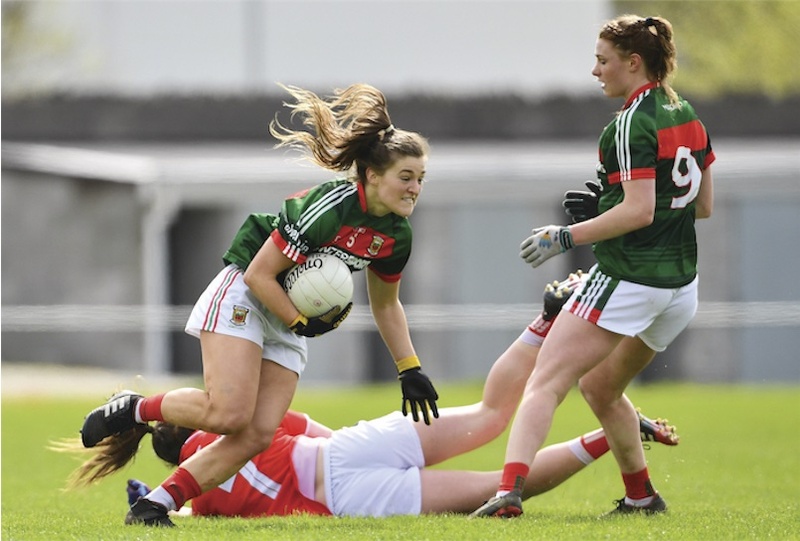 Last year, the Mayo ladies did for Cork in the All-Ireland semi-final and today at Birr they doubled down on the dosage by defeating the Rebels in the LGFA NFL Division One semi-final. In a high-scoring encounter at St Brendan’s Park this afternoon the Mayo ladies emerged victorious by 1-20 to 3-12. The scores came thick and fast all day at the midlands venue today. Mayo led by a point, 0-14 to 2-6, at the break but a third goal for Cork shortly after the resumption put them briefly in front. The advantage swung back and over after that but the Westerners grabbed the initiative in decisive fashion when Sinead Cafferkey got on the end of a move to palm the ball to the net (video clip here). The same player then made a vital intervention at the other end of the pitch in stoppage time. A last despairing attack by the League champions – who this year were aiming to make it six League titles on the trot – saw Aine O’Sullivan shoot for goal but Sinead Cafferkey was there to clear the ball off the line (video clip here). Peter Leahy’s side now head for Parnell Park on the May Bank Holiday weekend. There they’ll renew acquaintances with All-Ireland champions Dublin, who today overcame Galway by a single point, 2-8 to 2-7, in the day’s other penultimate round tie. The League decider has been fixed for 6th May (time to be confirmed) in what will be a repeat of last year’s All-Ireland final. Well done to the ladies on a super win today. Colm Gannon’s match report for the Mayo Advertiser is here. We should all get behind them and go to the final. The Mayo Ladies are developing into a great team again .. It made me feel like I was at the game. I was even getting nervous near the end! Compare this to some of the pitiful match reports that pass the editors in the “national” sports pages. Fair play to this team, they are winning some tight games which is a good sign of their heart and team spirit. For info – I’ve just added to the post links to the video clips of those two key incidents in the game, i.e. Sinead Cafferkey’s goal and her goal-line clearance. Mighty going ladies, fair play to them…best of luck in the final!! Well done to the ladies and best of luck in the final! A special mention for Sinead Cafferkey, scoring a goal at one end and making that block at the end. To get back on the line showed great instinct on her part, especially with her being a forward, so that made the goal line clearance even better. Well done Mayo Ladies. As I said before I wondered how this team would fare without Cora. It seems they are faring pretty well with individuals taking on more responsibility. With Cora I thought that they tended to rely on her too much for scores. To have evolved so well and made the league final says a lot about their maturity. I don’t tend to see very much ladies football as my main attention these days is with the men’s team but did make sure to see the games with Galway and Dublin with were paired with the men’s games and I waas very impressed with them. Sinead Cafferkey seems to be a huge addition to the panel and she really didd her stuff today. Roll on the final, it’s one I won’t miss, God willing. Hopefully Cora will be back in the panel for the Championship adding more firepower to the pack. Well done ladies Great win. @AndyD, The Ladies have done very well without Cora, as I taught they might. Cora has been a legend and is even still recently playing professional in Australia.. . …However our combined forwards have progressed wonderfully so far this year .. 1-20 against Cork says something about the collective… I wouldn’t like to change, or drop anyone in an already impressive and improving sextet of young forwards… It’s difficult question and impossible to give a certain answer at this early stage of the season… But Cora has been and is something else, without question or doubt the single best individual forward to ever play the game of Womens Gaelic-football .. And now with a few months of living the life of a professional Sport’s woman in her locker.. But who could you drop in order to accommodate Cora?.. It’s a fair question, someone would have to be dropped in order to include Cora.. And both Sarah Rowe and Grace Kelly are doing very well from play and very importantly from free’s. .. I think Cora could very well have a role to play, but not the role of old,.. She might even have to be happy with a place on the bench!.. I think that might be almost Blasphemy to some of Cora’s supporter’s.. It is something that will come up in the very near future if Cora decides to commit to the Women’s team for another year, to the best of my knowledge she hasn’t made any decision just yet… Who’d be a manager? Eh! Cora seems like such a dedicated servant of Mayo ladies gaa that while the champion and warrior that she is she mightn’t be happy sitting on the bench I’m sure if that what was asked of her she would. I don’t pretend to have any particular knowledge of the tactics in ladies football but would a role further back the field be something suited to her? Say CHB with a licence to look up and hit the passes into the forwards. Her accuracy is unreal so she’d be well able. Lessens the focus on just trying to get her the ball which is naturally what other players do when they have it and she is in the forward line. I was at the ladies match in Birr yesterday – what a performance. It was a very pacey game and made huge demands on fitness/stamina. The Mayo forwards were superb, particularly in the 1st-half when their decision making and score taking were almost perfect. Overall however there were a few caveats and most glaring was the Mayo kicks-out plan or implementation of same, which was killing them, especially in the 1st-half. Also, in such a free-flowing game, the apparent lack of real pace in a few positions was exposed, leading to Cork overlaps which was opening up the Mayo back-line far too often. That being said, I came away from Birr full of admiration for this Mayo group of players and management. 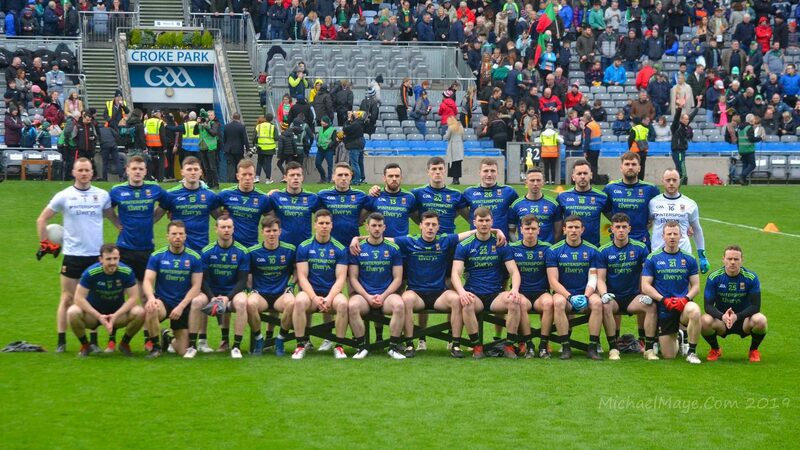 They were unrelenting and just would not accept defeat, indeed they played like a team expecting to win – Mayo men please take note. Leantimes, A manager has many headaches but one of the most tolerable must be having “too many” players. That is what drives standards in training in particular. The issue of accommodating Cora may not arise – she has said in the past that her continuing depends a lot on her contemporaries Martha Carter and Yvonne Byrne also continuing and they have not been featuring this spring. But she also indicated at the end of the Australian season that she would consider a return to Oz next winter. If she does intend to return to Oz would she not need to maintain fitness in the meantime? It would be a lot easier for a player of age 35/36 or so to maintain fitness than to regain it after a few months of idleness. Coming into a team performing as well as the current Mayo team might also be a very attractive proposition. Imagine having to face Cora as a second half substitute – what a nightmare that would be for any tiring defender. Well done ladies, brilliant stuff to come through such a competitive league and land in another final so quickly – May 6th is definitely one for the diary and could be a very inspirational day for lots of our county teams this year. I would think she shouldn’t be guaranteed a league final place because the team is going well but should be a starter come championship should she choose to rejoin. No doubt she could play any position on the pitch. However with a top player the preference should be to play them in their best position. I think the team improvement should encourage her to trust her teammates more to deliver. Tickets on sale tomorrow for Galway game,still no word if Stand tickets will be reserved with seat numbers or first come first served, I.e first in the door get the better seats. Are tickets on sale through the clubs only? Connacht gaa website says available online,Supervalu/centra and through clubs. Covered stand 30 and 25 for other three ends . So if ya buy a stand ticket surely it has to be reserved , can never for the life of me understand why they don’t number the seats to put a seat number on your ticket , would stop all the utter shitehawk stuff that goes on. @Shuffy Deck… The problem with Cora ‘definitely’ starting come championship , should she want to? is that you have to drop someone else in a young and rapidly improving forward line up!.. Mayo women are now playing a lot differently with the scores being shared by many different players… No one player is on the end of every move… I am inclined to agree with Andy D, the prospect of a tiring defence facing Cora as a second half substitute would be a sight to behold. Well done to the magnificent Mayo ladies. Their will to win is seemingly relentless. Cork bring out the best in them. I hope that they lift their game for the Dubs. They are becoming the proverbial monkey on the back. I see the league final is fixed for Parnell Park in a double header with the Div 2 final, Cavan v Tipp. Surely the LGFA could have found a neutral venue which would have suited all four teams without giving any team a particular advantage. Possibly Dublin ladies do not get to play in Parnell Park too often, just as Mayo ladies rarely see the inside of MacHale Park. But it is still in Dublin with Mayo supporters having to make the long journey once again. Could anyone tell me if season ticket holders will get a stand ticket or non-covered seating for the Galway game? And if it’s a stand ticket if there is a bring a friend option (unlikely I think)? As far as I know, the ladies’ League final is always played in Parnell Park, AndyD. I’d agree, though, it’s not really a suitable venue – regardless of who is playing in it – both in terms of geography and the facilities, which are basic enough. The stand is alright, albeit on the small side, but if the afternoon sun comes out you can be blinded in it. O’Connor Park in Tullamore would be a far better option, it’s a fantastic venue with a super playing surface and it’s easy to get in and out of as well. Apologies I should have clarified my question relates to 13th May rather than the ladies league final. WJ feel free to edit my comment if you wish. No worries, RockyRoad, I just edited it now to make that clear. I know the gaa has its rules and regulations but I didn’t really see anything wrong, in fact I was happy to see members nailing their colours to the mast when they came out pro and anti 8th ammendment. I think if anything it showed that they were taking it seriously and giving it the spotlight and consideration it deserves. If anything the gaa should come out and say what it’s position is on the 8th and not try and smother it’s members feelings and treat it as if it was a non issue. It’s a big issue for many people and fair play to any member who spoke up for what they believe, be it pro or anti. Point taken WJ. Thinking on it I’d have to agree with yea. Not the place for that conversation. Take down comment just in case it leads to other comments on the issue. Back to stroking out dates on the calender. It’s a long break between league and championship. Probably a.blessing for Mayo this year with players trying to get back to match fitness but a famine for the fan’s nonetheless. Thanks, Revellino – it’s as well leave the comment there just to show the context for the discussion on it. Whatever about that other date in late May, it’s starting to feel like the focus for us like-minded people is now squarely on the 13th of next month!